Gibson has used various methods of numbering from 1900, so it is not simply based on the serial number to identify the year of manufacture..
From 1902 to 1976, Gibson instruments have a serial number or a FON (Factory Order Number) or both. However, in the beginning this was not done consistently, so that there are also be instruments without identification. The serial number is stamped or punched on the back of the headstock or acoustic in the sound hole. The acoustic models are manufactured since late 1989 in Bozeman, Montana. If you want to know the production year of your Gibson guitar, you can decipher it with the serial number decoder, or find it in the tables below. Factory Order Numbers (FON) with a letter from 1935 to 1941. FON consists a batch number of usually four digits, followed by a one letter (sometimes prefixed by a space) followed by one or two digits (ranking). • 1935-1937: Letter between the batch number and the order number. W = Recording King (Montgomery Wards). If follows there is a third letter E, it stands for Electric. have been added the letter A, to the prefixes D, E or F.
Factory Order numbers with a letter from 1952 to 1961. The letter preceding the batch number in the FON, and indicates the year of production. The batch number, the first four digits of the FON, followed by a one or two-digit number. This letter shall stand before the FON lot number. This were used from 1952 to 1961 on archtop models and stamped on the inside of the F-hole. On flat tops it became the neck block stamped. Gibson serial numbers 1952 to 1961, solidbody model. An ink-stamped number from the back of the headstock. Gibson released solidbodies in 1952. No serial numbers were used, Gibson just started therewith in 1953. The first digit of the serial number is the last digit of the year. If the stamped number consists 5 digits, there is a space between the first and second digit (a separation between the last digit of the year and the actual serial number). When a six-digit serial number is concerned, there is no space, because the highest number in four digits (9999) has been exceeded and so fills the space. This was the case in the years 1955, 1956, 1959 and 1960. In 1955, Gibson forgot to put back the serial number range to 0001. So they had just put the year from 4 to 5. For this reason, the array of four-digit serial number was exceeded after 9999. Evidently the production was high in 1956 because "6 9999" is exceeded. Also in 1959 and 1960 there was a high production, "9 9999" is exceeded for "932 000" or higher. Therefore, the production in 1959 may be a "1", "2" or "3" in the second digit. Gibson stopped the stamped serial numbers at the end in 1960, although there are a few guitars made in 1961 with a "1" as a prefix. Some lap steels and Les Paul's from 1961 have such a serial number. Another exception to the above rules is in the autumn from 1958, where a some Les Paul Juniors and Specials had a four-digit serial number. Gibson serial numbers, early to mid seventies. From 1970 to 1975, the 6-digit serial numbers randomly generated. In a random sequence numbers were stamped on the back of the headstock. For some instruments, preceded by a letter. In 1970, the orange labels in the body of acoustic guitars were replaced by white with orange rectangular labels. The electrical models were provided with a rectangular with black and purple triangle. It was also from 1970 "MADE IN USA" stamped on the back of the headstock. Some instruments from the fifties also had been such a stamp. The same confusing six-digit serial system of the sixties was maintained until 1975. This means that instruments with the same serial number can be from the 60s or 70s. Guitars got six digits in any order, and in some cases they were preceded by a letter that none seemed to have no smeaningful sense. Note that the series of between 1970 and 1975, may be an overlap from production in 1964 and 1965. The table below shows the years in which the numbers could relate. The most sustainable numbering system Gibson was launched in 1977, an eight-digit number. The first and fifth digit representing the year of manufacture. The three intermediate digits, the day of that year. The digits to six to eight gave the serial number. After opening of the new factory in Nashville, in the sequence numbers were also included the production site. 001 to 499 appeared on the instruments built in Kalamazoo, 500 to 999 built in Nashville. Even after the closing of the factory in Kalamazoo in 1984, this process was continued until 1989 in Nashville. In 2005 the system was upgraded to first digit at the end of the batch number was inserted. The sequence numbers were 500 to 699, after which the batch number 1 was increased, and the number returned 500. Serial numbers 2014 to present. Gibson's most simplest system was introduced in 2014. A nine-digit serial number stamped. 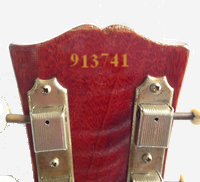 The first two digits indicate the year, the rest is the serial number for all guitars produced that year. Every year starts with serial 0000001. Gibson serial numbers, from February 1961 until 1970. Gibson began a new series of numbering system in 1961. They wanted to introduce a more structured series of sequences but in practice, the opposite happened. During this period, numbers were reused, and in many cases the numbers were not strictly applied for the consecutive years. For all models, the serial number on the back of the headstock is stamped. Some serial numbers are duplicated from 1963 to 1969. From this period, the 5-digit and 6-digit numbers can be confused easily and gives the wrong date.